Alagir is an artist of two-dimensional and three-dimensional space. Field of Contemporary Art, Conceptual Symbolism. Alagir is a Member of the Art Union of the Artists at the Academy of Arts of Uzbekistan. Member of the Professional Union of Artists of Russian Federation. Alagir is an art pseudonym, derived from the location of the ancestral homeland, taking its origin from the ancient Scythian-Sarmatian-Alan kind: Ossetian Digors, located in the western part of the Northern Caucasus. Pseudonym Alagir is officially recognized and registered in the International Art Directories and public academic archives. 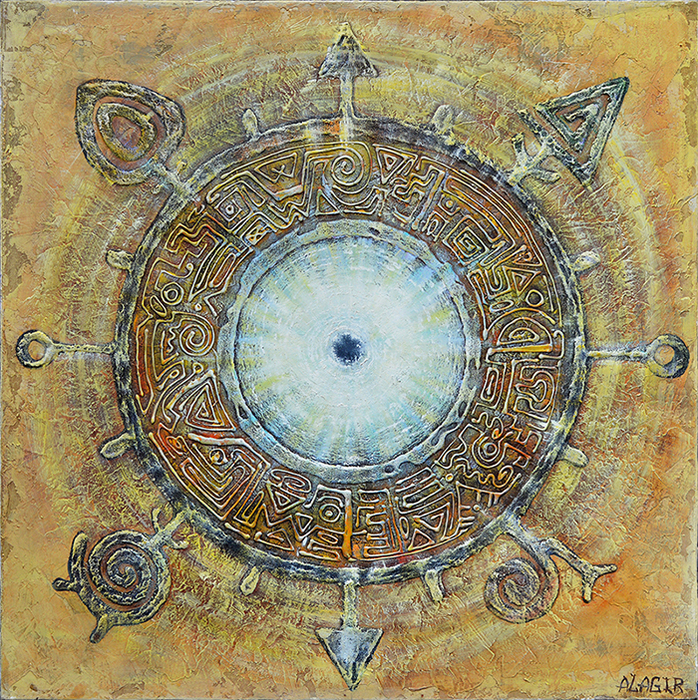 The main inspiration of Alagir art is the symbol of the Sun and its conceptual reflection in vital activity of human life. 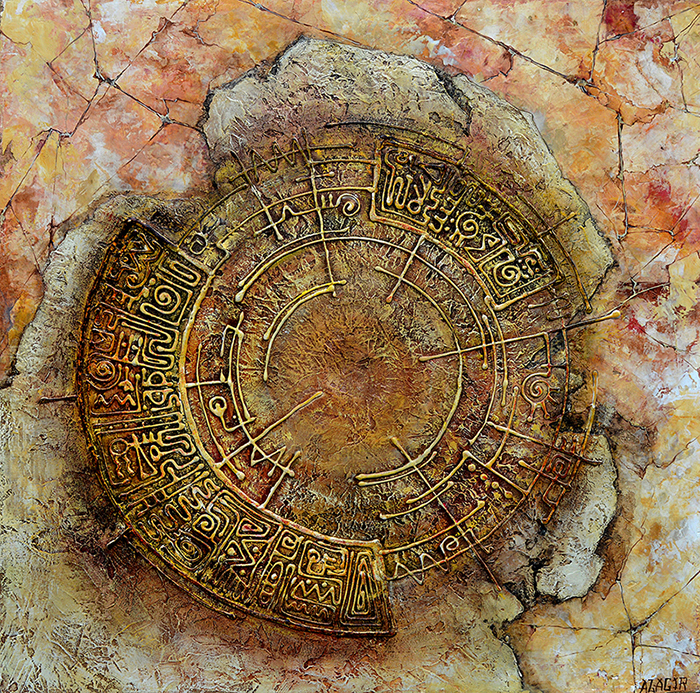 In 1997 Alagir originated her art direction- "Mystery of the Sun", which consists of independent , but complementary to each other projects: «PROTOART», «The Temple of The Sun", "Altar of Eternity," "The Priestess of the Sun", "The Lost Civilizations", " Astrological Ages of the World ", "Accessories of the People of the Sun "," Vessels of Life. " The art project consists of artwork, created using different techniques and art genres: paintings and drawings, installations, mural paintings, art jewelry. 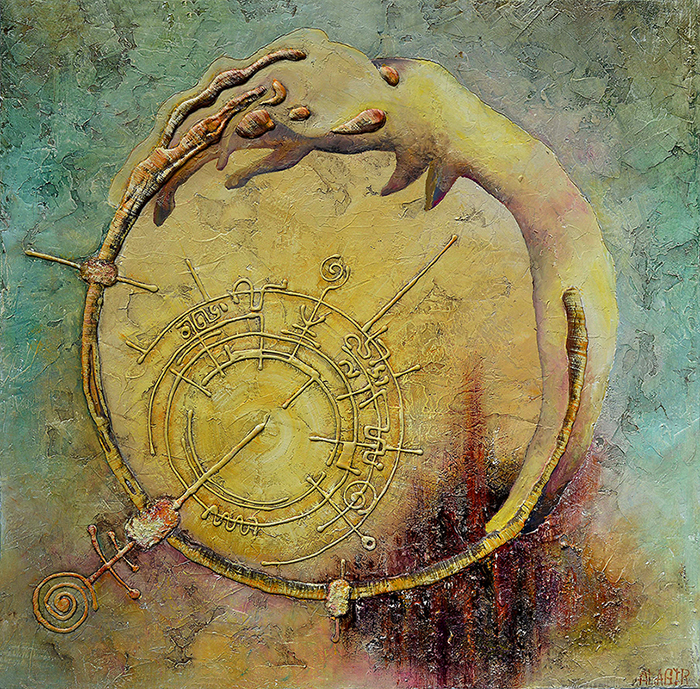 Since 2004 art work of Alagir recorded and rated in the Unified Artists Rating-Rating Center of Professional Union of Artists of Russian Federation, under the nomination "Artist of two-dimensional and three-dimensional space." 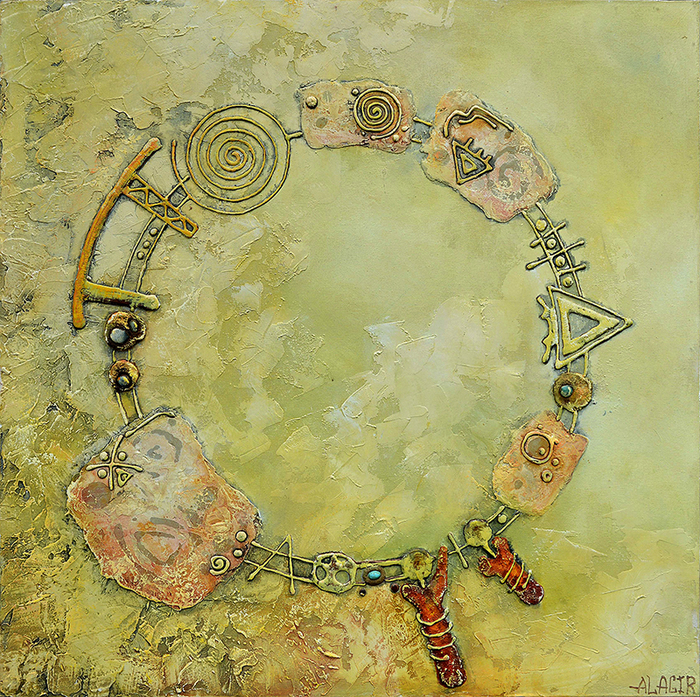 Alagir works can be found in public galleries, business and private collections in Russia, Australia, Italy, Israel, France, USA, Canada, Uzbekistan, and Yugoslavia. 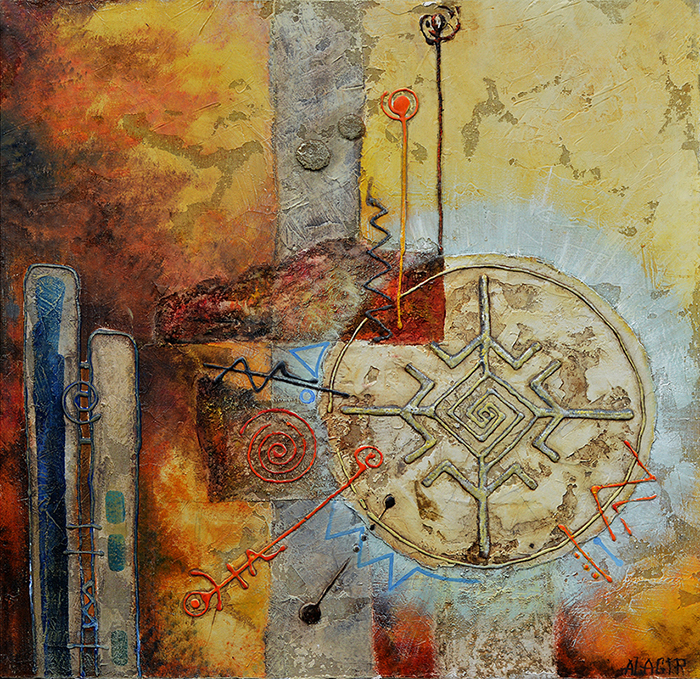 Prerequisites of theme of the Sun in Alagir art and her creativity were her three basic intellectual needs. It was the Need for Personal Development and the search for answers about the Meaning of Life, the need to build a life in accordance with the wishes and the need for Creative Expression. It is a Personal Journey of self-knowledge and knowledge of the laws of the world. Thanks to her love for studies in the fields of psychology, sociology, philosophy, world history, culture and ethnography, with time Alagir formed an understanding of self and the overall ‘Picture of Concepts’ on the Ideals, Values and needs of both People and Humanity as a whole. And also, the desire of people to acquire The Desired life and Sacred Knowledge, which has the described way of centuries-old experience and the ways to achieve the Desired Life. 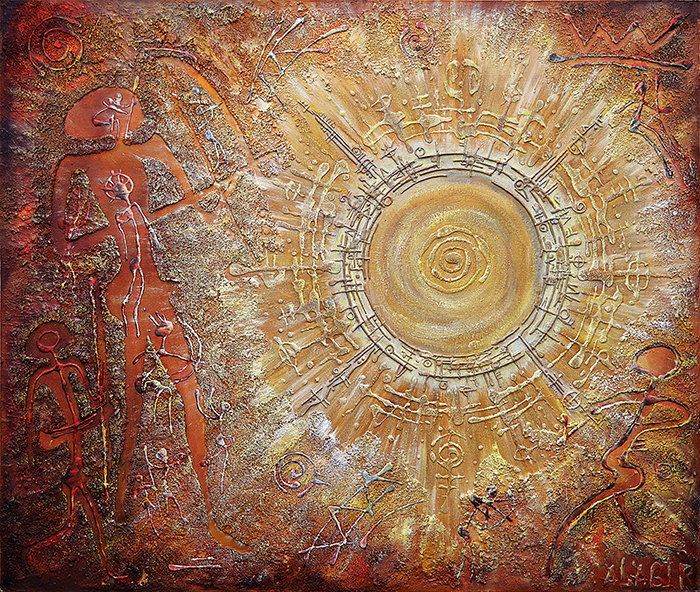 The personification of this ‘Picture of Concepts’ Alagir in her work has chosen - the Sun. But the Sun, as a conceptual character symbolizing the Path of Self-Knowledge, Development and Achievements. Further, the idea was born - to create art direction "The Mystery of the Sun", which will present and disclose this topic, reflect the knowledge and the light. Given theme’s key role in the important areas of human life, art direction will accommodate a number of individual and complementary projects, which, to some extent, will contain the conceptual symbolism of the Sun.